I’ve never done a meme before on my blog. This one’s spreading like wildfire among my Facebook friends, and appealed to me for some reason. Enjoy! 1- My last name is Arabic, and means victory. 2- I am from a very mixed background: my father was born in Egypt of a Lebanese father and Italian mother (one of whose parents was Yugoslavian, I think); my mother is French-Canadian. 3- I have played at various points in my life in school and community ensembles: the recorder, the glockenspiel, the clarinet, the bass clarinet, the saxophone, and my voice. I never learned to play the piano and kind of wish now that I had – I am now slowly learning Bach’s invention #4, and the slow bit of Beethoven’s Moonlight Sonata. It ain’t pretty. 4- I was a database administrator before Zoë was born. I’m not sure that I want to go back to it when I start working again. 5- I knit rather a lot. I also crochet and sew. 6- I have lived in Ottawa, Waterloo (and Conestogo), Toronto and Seattle. 7- I never really wanted to get married, but ended up doing it when I was pregnant with Zoë in the US and needed medical coverage for the delivery. 9- I am not a patient woman. Sometimes, I hate that. Often, I am surprised that more people aren’t impatient about the things that frustrate me. 10- I have never owned a car. The only time I really wish I had a car to live my day-to-day existence is when it’s raining. 11- I like winter very much. But I don’t like having to bundle up the kids to go out. But I love being out in softly falling snow. But the lack of sunlight gets to me after a while. But I love to see the world all silent and covered in white. But sometimes I need more colour that white, grey, and slushy brown. Winter is apparently a time of inner conflict. 12- I will eat pretty much anything. 13- I am a very good starter of projects. I am a much less good finisher of them. 14- I’m on the cusp between Introverted and extroverted (according to Myers-Briggs). I need time by myself, but very much like to be in the company of my friends. I’m fairly shy and unassertive in situations where I know few people, but will run off at the mouth when I’m with people with whom I’m very comfortable (and for that last one, I apologize…). 15- I love to cook, especially when I have long stretches of time to plan and execute. 16- I have only lived by myself for 12 months of my life, and really enjoyed it. 17- If I had to go to university again, I would probably pursue a program in linguistics rather than the Mathematics degree I ended up getting. I love language. But when I was in high school, I was very proficient in the sciences and never even considered the possibility of Arts and Humanities as a course of study. 18- I’m one of the few people I know who had a good time in high school. 19- We haven’t had cable TV for about 8 years, and I hardly ever listen to commercial radio, so I feel very out of touch with current popular culture. 20- My very earliest memory is of me stirring scrambled eggs on the stove while standing on a chair with my brother crawling underfoot. I couldn’t have been more than 3 and a half years old. 21- I have been to only 6 Canadian provinces. Left to visit: Manitoba, Saskatchewan, Nova Scotia, Newfoundland and the Territories. I’ve only spent time in three European countries: Italy, Switzerland and France. Obviously, I need to travel more. 22- I’m claustrophobic. Those scenes in movies where they lock people in car trunks for whatever reason give me the heebie-jeebies. I discovered this particular trait during my one and only time spelunking where I embarrassed myself by freaking out at having to go through a crawl space which I couldn’t see the end of. 23- I am an ok singer, and have sung solo in public (accompanied by a talented guitarist friend of mine), but prefer the safety of being in a large choir. 24- I have been with my husband for 15 years. He dated a roommate of mine in university, and I really didn’t like him at the time. Now I think he’s pretty awesome. 25- I still feel like I’m just playing at being a grown up, even though I’m 36 and have two kids and a mortgage. I just realized I never posted a picture of me wearing my Yosemite. So here it is! I wore it at two parties last Saturday. Comfy and didn’t get all stretched and limp by the end of the evening. My only beef is that since the yarn is so slippery, and the placket is subjected to a fair amount of stress, the buttonholes stretched over the course of the night. So I think I’m going to sew it down, and have the buttons on there just for show. ObscureCanLitMama took me up on my Calorimetry offer, so I whipped one up on Saturday (no photos, sorry!). It’s a little big, though, so I’ll redo it. Anybody else? Sorry about the lousy photo. 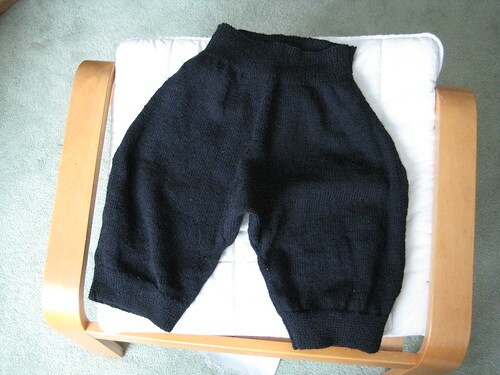 I looked it up online, and apparently women wore these a lot in the first half of the 20th century. I guess to keep your head moderately warm and your bun intact? See what happens when I apply myself? It’s Yosemite! And all it needs is buttons! And the sleeves fit right! I’ll take a picture of me wearing it after the buttons are on. It’s a touch too long in the torso, but otherwise, it’s great! Concert,snow, other concert, two more concerts, snow, Christmas, warm, no snow, New Year’s, snow, cold, snow. And eating in between. Actually, it was a very nice holiday season – we stayed home this year, and had a nice quiet Christmas, complete with tourtière and bûche de Noël, just the four of us. The visitors who were supposed to come before and after Christmas couldn’t for various reasons, but we had very nice guests who came over New Year’s, and brought their children to entertain my children, and themselves to entertain me. Ecogrrl and Clevermonkey had a great New Year’s party (my new favourite drink is a Manhattan made with one of their homemade maraschino cherries. I made one for myself on the weekend, sans cherry, and it just wasn’t the same. I know what I’m going to be doing with sour cherries this summer!). Mostly we hung out, stayed in our jammies until ridiculously late in the day. 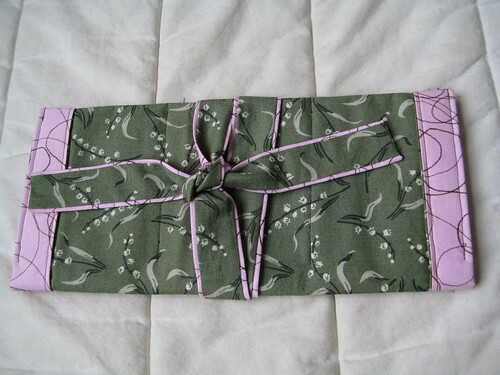 That was a ‘gadget roll’, made for ecogrrl, who came back for a brief, but very nice, six week stay. She’s back in Ghana until June. I miss our coffee dates already. 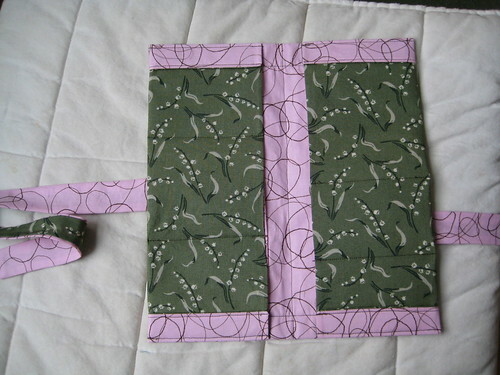 Anyway, the roll was from a pattern in Stitch Magazine, and fabric I had on hand. Stitch is a special issue of an Interweave quilting publication, and I really hope they decide to make it a regular magazine, because it was fantastic! I had one Spinrite project come and go. It was a tabard made from brown acrylic. 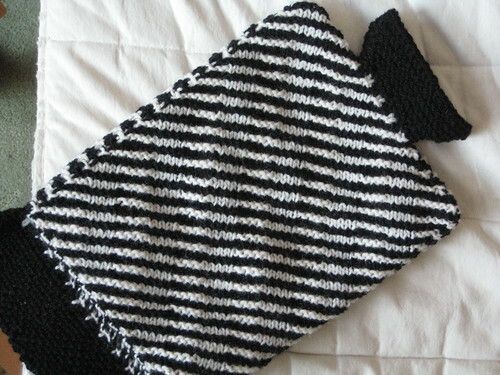 I didn’t know what a tabard was until that project. Turns out it’s a formless, unflattering tunic with built-in short sleeves. I didn’t take pictures. I worked a little on the Yosemite, and tried another variation of the sleeves, which finally worked, but I wasn’t happy with the cast off, so it went back in the naughty corner for a couple weeks. I finally made a sleeve I’m happy with last night. So I have one left to do, which ought to take me another three months, even though it’s maybe 2 hours of work. I just now finished the knickers for the Red Cross. They sat, with about 5 cm of seam left to do for two weeks because I made the mistake of putting them down before they were totally done. They are not pretty. But I bet they’re warm! And I can’t try them on, because I haven’t had a waist that small since I was a teenager. So we have to believe they look better on (or not – they’re not meant to be seen, so who cares?). Neat, huh? 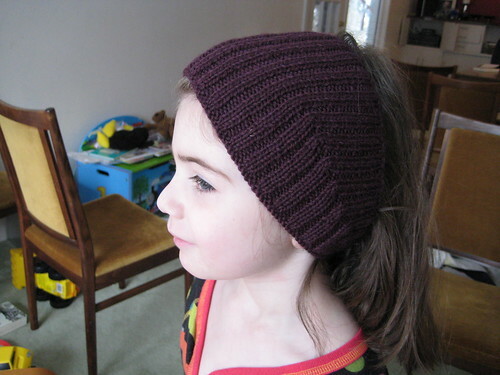 You get the easily customizableness of garter stitch without the endless tedium. 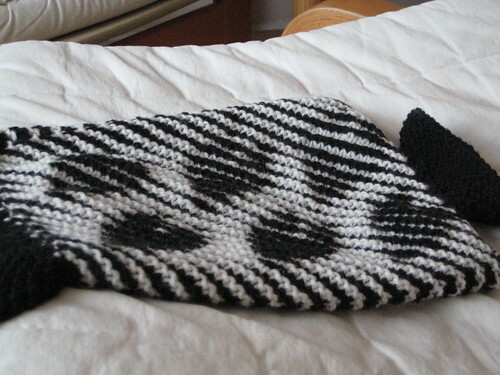 I have to make one more (the last hot water bottle is currently being kept cozy with an old t-shirt of Zebula’s). The hearts didn’t turn out as well as I would have liked, but that’s what you get for designing on the fly rather than sketching things out first. Oh, and in case you thought I was cruel for not providing a hot water bottle for Dr. Thingo, he doesn’t believe in them. No, he believes in hogging mine, despite his repeated assurances that he doesn’t need one for himself. Way more fun than 2×2 rib deserves to be. 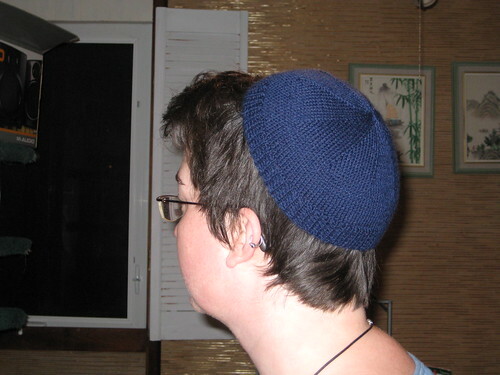 Now I want one for me, even though it’ll look goofy with my short hair. And I’ll make one for any long-haired person that pipes up and says they want one – they take only a couple hours to whip up. 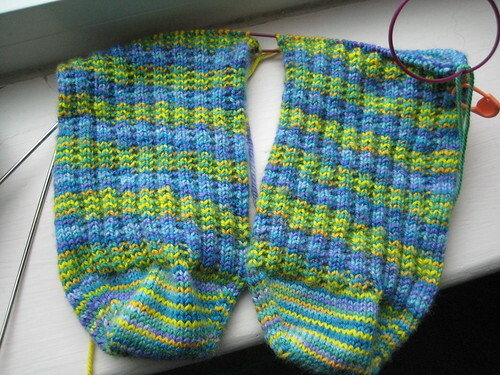 I started a new pair of socks, from yarn I purchased from Lofty Fibres at the last Stitch n’ Kitsch. It makes me ridiculously happy to work with something that looks like irises at this time of year. 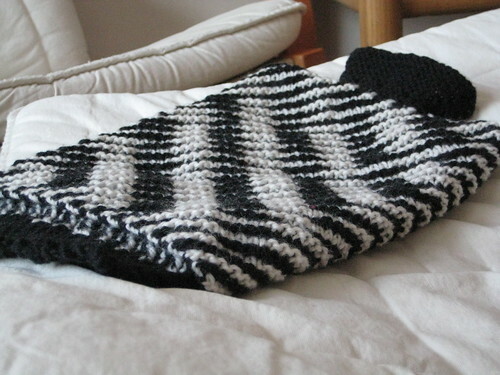 This is my first attempt at making two socks at the same time on one circular needle. And though it feels like it’s taking forever, I like it. I don’t have to remember what I did to the first sock to make it match the second. The pattern is a something I saw on a sock online somewhere, where you alternate a round of k2, p2 ribbing with a round of just knit. I can’t remember where I saw it. 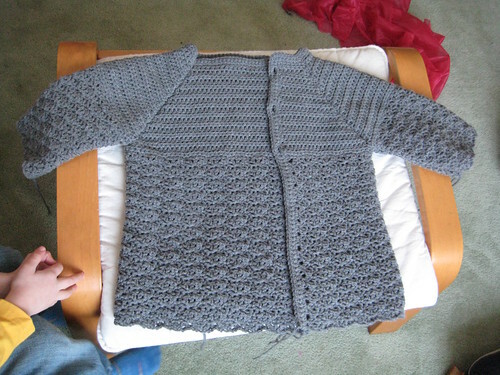 And I have a new project for Spinrite – crochet this time. 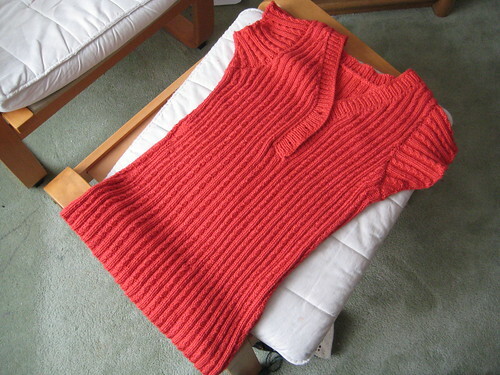 A cardigan, worked in Bernat Supersaver, a surprisingly nice acrylic to work with. I’d forgotten how fast crochet works up. I made this in less than a week. While we’re looking at it, can someone explain to me the point of short-sleeved cardigans? Or coats, for that matter? I see them everywhere, and I don’t get it. On the other hand, I’m a fashion disaster, so it could just be beyond my capacity to understand.